Deferred Action may grant many public assets to undocumented youth. These assets are being left to the states to decide. One which is the most discussed is that of the privlege to drive. California, the state with the most eligible applicants to deferred action is still deciding wether or not licenses will be issued, but another state with a high number of applicants is giving the green light to DREAMers. AUSTIN -- Governor Rick Perry says President Barack Obama's new immigration policy will not change anything in Texas. Deferred Action for Childhood Arrivals (DACA) allows some undocumented immigrants between the ages of 16 and 30 who came to the U.S. as children to live and work legally without fear of deportation. 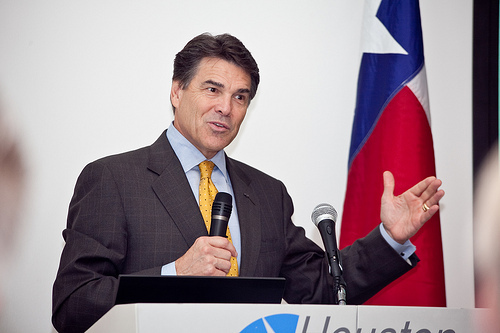 In letter sent Monday and addressed to Texas Attorney General Greg Abbott, Perry expressed strong disagreement with the Obama Administration's policy. In it, Perry informed state agencies the program "does not undermine or change our state laws," calling it "a slap in the face to the rule of law." Last week, Arizona Governor Jan Brewer pushed back against the policy, announcing the state will not offer driver's licenses to those who qualify. Perry's letter Monday led initially to confusion and speculation over whether Texas had similar intentions of actively resisting the federal initiative. "We are aware that there's not much that we can do with deferred action in Texas," said University of Texas student and DREAM activist Adrian Reyna, who was brought to the U.S. at the age of 12 and has been waiting the results of citizenship petitions for more than 16 years. "We don't need the governor to remind us of that. We're reminded of that every day." While strong in its denouncement of DACA, the governor's memo doesn't actively block any provisions. For example, those accepted under the program will be able to apply for a Texas driver's license using their new federal work permit. "In Texas, we do allow persons with the authorization to work from the federal government to obtain a temporary driver's license," said Austin immigration attorney Paul Parsons. "When young people are given permission to work in our country, they ought to be allowed to drive to and from work and to get driver's licenses and car insurance." Applicants who present federal immigration documentation indicating approved “deferred action” (I-797) meet the Department’s current lawful presence policy. If they are otherwise eligible (i.e. have met identity, residency, Social Security Number (SSN), and other requirements), they can be issued a driver license with an expiration date based on the length of lawful presence indicated in the federal immigration documents. Someone who has been granted “deferred action” and presents an Employment Authorization Document (EAD or I-766) meets the Department’s current lawful presence and identification policy. If they are otherwise eligible (i.e. have met residency, SSN, and other requirements), they can be issued a driver license set to expire when the EAD expires. Applicants must either provide their Social Security number or fill out an affidavit saying they don't have one prior to the issuance of a driver license. According to the governor's office, if a state agency currently accepts federal work permits for benefit or service applications, they will continue to do so. The process itself is complex, and has led to fear and confusion among those considering applying. One of the most commonly voiced concerns has been that a rejected application could lead to deportation. "The program clearly states that as long as the applicant is truthful, the government will not use the information to try to deport that person or the applicant's relatives," said Parsons. A more pressing issue may deal with "notarios" and other unqualified immigration "consultants" already implicated in dozens of scams in which immigrants thinking they were applying for DACA were cheated out of their money. Parsons warns people to be careful about who they consult when it comes to applying for relief. "In Latin America, 'notario publico' is a lawyer," said Parsons. "In the United States, that's a notary public who's not authorized to give legal advice." Meanwhile Reyna says many are frustrated. "We are American in every way, and the only thing that is keeping us from being completely defined American is our citizenship," said Reyna. "We just really don't understand why is it that Jan Brewer, Rick Perry have to continuously use this, our lives and our future as some sort of political thing." It's a political thing that many on both sides are passionate about, and which way the majority is leaning could be reflected when the president comes up for popular review in November.